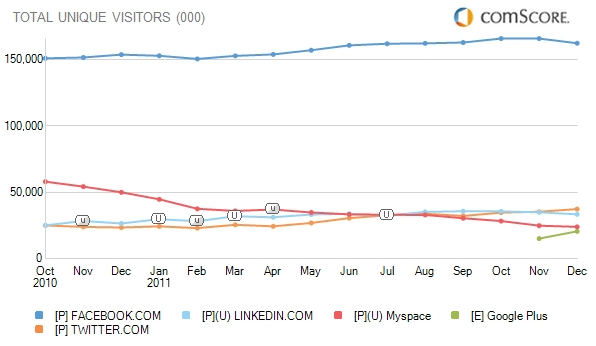 If you look at just one month of data, you’ll see that Myspace still has users. That’s the good news for the aging social network. The bad news is that it has kept losing them through its many executive changes, redesigns and the recent acquisition by Specific Media and Justin Timberlake. Maybe that new plan to do something with TV will turn things around? Anyway, the latest US numbers from comScore are out now, for December, and here’s how MySpace stacks up against its many rivals. Facebook is continuing to lead, by far, as it has for a long time. It has 162 million monthly unique visitors, which is down from 166 million in November. Yes, that’s a drop. But don’t freak out and try to equate this with “Facebook dying.” It has had seasonal fluctuations over the years that it has kept on growing through. Also, it’s hard to keep growing when you already have most of the online population on your site. If anything, expect Facebook to have slower or flattish monthly numbers from now on in the US and other mature markets. The graph above excludes Facebook because it’s so much bigger than everyone else that it hides the other details; the one below includes it. Twitter, meanwhile, grew by about 2 million new people to 37.5 million uniques, keeping rough pace with what it has been doing over most months since April. LinkedIn is on a bit of a decline after plateauing sometime in August, down a little under 1.5 million from November to 33.5 million uniques. What about Google’s big new, heavily promoted social network, G+? It has gone from 15.9 million uniques in November to 20.6 million last month. ComScore’s December worldwide numbers aren’t out yet, but going by the November ones, G+ seems to be on the up and up everywhere. Finally, as always, here’s your caveat that even though comScore is generally considered to be the most reliable third-party measurement service out there, it’s not perfect. So these numbers may not be 100% right. Okay, now for some Monty Python.